Noosa Heads is a cosmopolitan coastal town on the southern shore of Luguna Bay, located on the Northern end of Queensland’s Sunshine Coast approximately one hour’s drive north of Brisbane. It is a vacationer’s paradise for all ages and all lifestyles; beautiful sandy beaches, turquoise blue water, parks, designer boutiques, art shops and surf shops, there is definitely something for everyone, of every age. My husband and I rented a beachfront, one bedroom apartment on the second floor of a three level apartment building. The apartment was very clean, bright, spacious and very well equipped, it was like being at home, we even had a laundry room just down the hall. We had a fabulous, unobstructed view of the ocean from our large shaded deck, and easy beach access through a public walkway on the front street. Noosa Heads offers a complete range of accommodations from the luxury beachfront suites to backpacker’s hostels and for the truly adventurous vacationers, why not rent a houseboat. We were unpacked and looking for a grocery store in no time. We were so excited about exploring this beautiful area but first we needed to take care of the necessary tasks – buying groceries. There were several food stores to choose from just down the street. Australian dollars (AUD) are used in Noosa Heads; either exchange your money at the local Bank or use one of the many ATM’s available in the town. The only thing left to do was to enjoy our four night/five day stay. There was no end to the activities that would keep us occupied during the day that is if we wanted something to do. 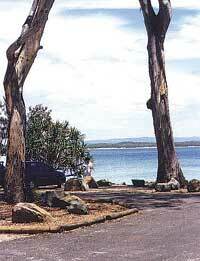 We could take a walk through Noosa National Park, easy to find, we just followed the signs to the walkway. The view of the ocean and surrounding areas were spectacular; the walking trails were easy walking, it wasn’t necessary to be experienced hikers. We stopped along the path and listened to the birds singing in the trees, examined the different plants and wild flowers growing under the shade of the trees, and took many pictures. We took a walk over Noosa Hill to Noosaville on the Noosa River. We will never forget our walk the second morning of our stay. The trail to Noosa Hill was very well marked so we had no problem finding our way; there was a nice walkway through the wooded area so walking was very easy and it didn’t involve much climbing. Because the pathway only allowed for walking single file, but that only increased the sense of being closer to the surroundings. The birds were singing and the air smelled spicy and almost medicinal from the Tea Trees, Australia’s natural healing wonder – Tea Tree Oil. Suddenly we slowed our pace and over my husband’s shoulder he said “Look at the lizard”; now, I’m not a fan of lizards, but my curiosity told me that I needed to see what he was talking about. 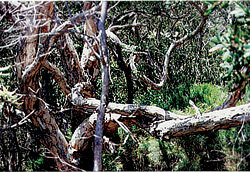 He took a step sideways off the path and there standing only a few yards away was large green lizard. The lizard was about five feet long from its nose to its tail, and while staring at us, it kept sticking out its long, skinny tongue. To me, it looked 8 feet long and it was probably going to eat us! The lizard animal walked off into the bush, minding its own business, and I was much relieved. I would have stood in that very spot for the remainder of the day except the thought of the lizard coming back convinced me I should keep moving. Once I could actually make my legs work I ran until I was out of the wooded area, continually checking over my shoulder to make sure we didn’t have company following us. 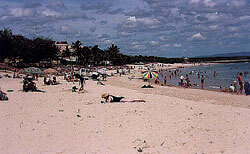 Noosaville is a small but busy community. It offers vacation accommodations, several restaurants, boutique shopping, grocery stores, and two small shopping centers. We walked into the first store we came to, a Drug Store. I went directly to the first clerk I saw and told her about this huge lizard like creature we had just encountered, the size of which was growing each time I thought about it. Did she know that such a creature was lurking in the woods right next to their store? She smiled at me and said “Actually that’s Noosaville’s Pet Iguana, he’s been around for years and he won’t hurt you unless you threaten him”. In true Australian fashion she shrugged it off like it was nothing. If you enjoy water sports, there were many to choose from, or if you just wanted to soak up the sun, with a cool drink and a good book, the beaches were clean and just waiting for you to enjoy. Even though we had stocked the cupboards of our apartment with groceries, it is always fun to sample the local cuisine. There were many restaurants in Noosa Heads to choose from, be sure to treat yourself; they use fresh, locally grown tropical fruits, spices, ginger and sugarcane in their menus along with many fresh seafood selections. Don’t forget to bring your own bottle of wine, its quite acceptable. This was a perfect holiday escape and we would definitely recommend it as a “must visit” destination. If you go, take your Passport and Visitor’s Visa, fly into Brisbane and buy a ticket on an Australian Greyhound Bus; the bus will conveniently drop you off in the middle of town. Check in at the Tourist Information Booth or ask anyone on the street for directions to your accommodations. Renting a car in Brisbane is another option but since they drive on the left hand side of the road, why be stressed out when you arrive, let someone else do the driving and just enjoy your vacation.